Iselle is a category 3 hurricane well ESE of Hawaii. It will likely affect the Hawaii Islands in a much weaker state late Thursday and Friday. As of 2 AM PDT / 5 AM EDT Bertha was centered at 16.0 N / 135.6 W or about 1305 miles east of Hilo, Hawaii. It was moving west at about 9 mph. Top sustained winds are estimated at 125 mph. Pressure was estimated at 958 mb. Iselle will move WNW and approach the Big Island of Hawaii by late Thursday. It is likely not going to be a hurricane by then as hurricanes only approach from the south - not east. The main threat will be from increasing heavy showers, large swell on east facing beaches and winds to tropical storm force - especially over the mountains. Iselle is a category 4 hurricane well ESE of Hawaii. It will likely affect the Hawaii Islands in a much weaker state late Thursday and Friday. As of 2 PM PDT / 5 PM EDT Iselle was centered at 16.1 N / 137.4 W or about 1190 miles east of Hilo, Hawaii. It was moving west at about 10 mph. Top sustained winds are estimated at 140 mph. Pressure was estimated at 947 mb. Iselle will move WNW and approach the Big Island of Hawaii by Thursday. It is likely not going to be a hurricane by then as hurricanes only approach from the south - not east. The main threat will be from increasing heavy showers, large swell on east facing beaches and winds to tropical storm force - especially over the mountains. Iselle has weakened some overnight, but still looks impressive on satellite imagery. It will gradually move over cooler water the next few days allowing it to weaken to a tropical storm before affecting the Hawaiian islands. As of 2 AM PDT / 5 AM EDT Iselle was centered at 15.9 N / 138.6 W or about 1115 miles east of Hilo, Hawaii. It was moving west at about 8 mph. Top sustained winds are estimated at 125 mph. Pressure was estimated at 955 mb. 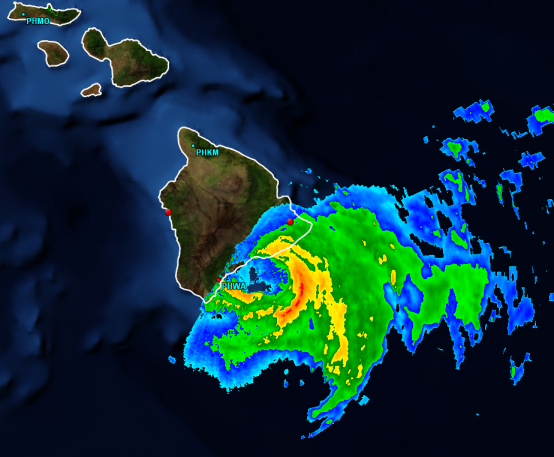 Iselle is gradually weakening as it approaches the Big Island of Hawaii. It is now a category 1 hurricane as cooler water temperatures drain the energy from the system. The Big Island will see increasing east swell later today into tomorrow. As of 2 AM PDT / 5 AM EDT Iselle was centered at 16.9 N / 144.1 W or about 745 miles east of Hilo, Hawaii. It was moving west at about 13 mph. Top sustained winds are estimated at 90 mph. Pressure was estimated at 979 mb. Iselle is now forecast to be a hurricane on the Big Island. I personally think that it will be a tropical storm with gusts to hurricane force possible over the high volcanoes. Most areas will see tropical storm force winds. A recent recon measured winds just over hurricane force (74 mph), so I don't think the winds are as strong as were in the official advisory prepared earlier. As of 2 AM PDT / 5 AM EDT Iselle was centered at 18.1 N / 149.1 W or about 405 miles ESE of Hilo, Hawaii. It was moving WNW at about 18 mph. Top sustained winds are estimated at 80 mph (90 mph CPHC). Pressure was estimated at 986 mb. Iselle will move over the Big Island late today. The main threat will be from increasing heavy showers, large swell on east facing beaches and winds to tropical storm force with possibly hurricane force over the high volcanoes. Satellite imagery shows that Iselle is weakening. The cloud tops are warming around the broken eyewall. It will not arrive at the Big Island as a hurricane IMO. It is possible the CPHC will keep it as a minimal hurricane even though the latest recon shows it now below hurricane strength. Some gusts to hurricane force are still possible high up on the slopes of the volcanoes which are nearly 14,000' high. Resort areas will see rain squalls with tropical storm force winds. As of 8 AM HST / 2 PM EDT Iselle was centered at 18.6 N / 151.4 W or about 255 miles ESE of Hilo, Hawaii. It was moving WNW at about 17 mph. Top sustained winds are estimated at 70 mph (80 mph CPHC). Pressure was estimated at 990 mb (latest recon). Iselle will move over the Big Island late today. The main threat will be from increasing heavy showers, large swell on east facing beaches and winds to tropical storm force with possibly hurricane force gusts over the high volcanoes. CPHC is still calling Iselle a hurricane. I simply don't believe this is accurate. The latest recon found a 992 MB pressure, 47 kt surface wind and a 72 kt flight level wind at 700 MB - approximately 10,000 ft aloft. Satellite representation of the structure does not support hurricane strength. Some gust will very likely be to hurricane strength over the high mountain peaks which rise to almost 14 thousand feet. Most resort locations will see tropical storm force winds and rain squalls. As of 2 PM HST / 8 PM EDT Iselle was centered at 18.9 N / 152.9 W or about 150 miles ESE of Hilo, Hawaii. It was moving WNW at about 17 mph. Top sustained winds are estimated at 65 mph (80 mph CPHC). Pressure was estimated at 992 mb (latest recon). CPHC finally downgraded to tropical storm just before landfall. The highest wind gust at the coastal towns so far has been 44 mph at Hilo. It's possible that winds have been stronger over the more rural areas SE of the Big Island. Winds will diminish later today as Iselle interacts with the very high terrain of the Big Island disrupting its circualtion. As of 11 PM HST / 5 AM EDT Iselle was centered at 19.0 N / 155.1 W or about 45 south of Hilo, Hawaii. It was moving west at about 7 mph. Top sustained winds are estimated at 60. Pressure was estimated at 1001 MB. Iselle will continue south of the Islands later today. The main threat will be from heavy showers and winds to tropical storm force with possibly hurricane force gusts over the high volcanoes. Visible satellite shows that Iselle's circulation has been greatly disrupted by the mountains on the Big Island. The strongest wind gust at a major town was 47 mph at Kahului. Winds have diminished across the Islands. As of 11 AM HST / 5 PM EDT Iselle was centered at 19.5 N / 158.0 W or about 125 south of Honolulu, Hawaii. It was moving west at about 15 mph. Top sustained winds are estimated at 40 (50 mph CPHC). Pressure was estimated at 1009 MB. Iselle will continue moving west, south of the Islands and weaken to an extratropical depression soon.